Among the Chinese arsenal of edged weapons are a number of double weapons with half hilts that fit in a single scabbard. Among these are the shuangjian (雙劍) or "double straightswords", hudiedao (蝴蝶刀) or "butterfly swords" and shuangdao (雙刀) or "double sabers".1 The double swords and double sabers in turn tend to come in short versions and long versions. Short double swords and sabers are seen depicted in 18th century artwork, worn by various peoples within the Qing realm, probably for self defense purposes.2 The most common double long saber is the niuweidao , these sets are fairly common on the market and often consist of two fairly flimsy blades. They were primarily used by martial artists who often made a living as street performers, twirling their light swords around in a manner not unlike modern wushu. 1. Butterfly swords are known in Cantonese as baat jaam do (八斬刀) or "eight cutting knives" referring to its form of use. 2. See for example the 1751 Huang Qing Zhigong Tu (皇清職貢圖) or "Qing Imperial Illustrations of Tributary Peoples". 3. More on the gunbei , see the article on Great Ming Military Blog. 4. See the Qianlong and Jiaqing editions of the qinding junqi zeli (欽定軍器則例) or "Imperially Commissioned Regulations and Precedents on Military Equipment" for mentions of shuangdao being issued to nearly every Green Standard Army provincial station. Materials: Iron, steel, brass, wood, leater, cotton. 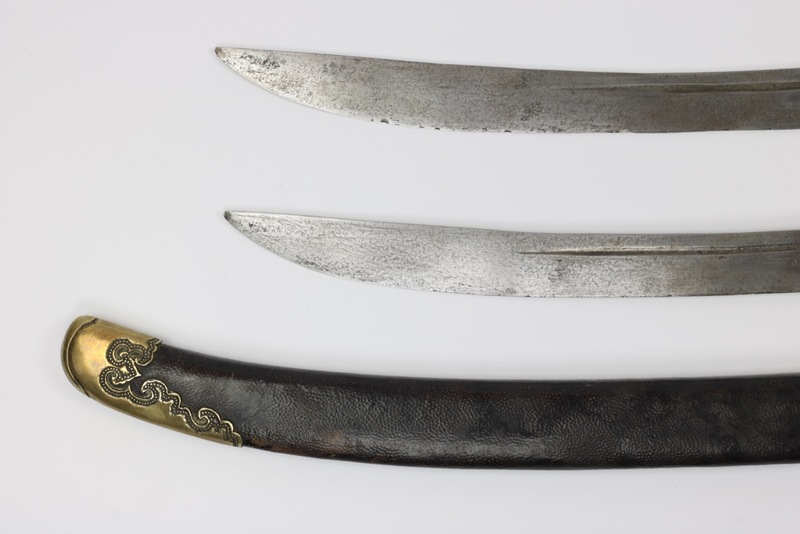 A rare set of shuangdao or double sabers of liuyedao form with narrow blades of moderate curvature. 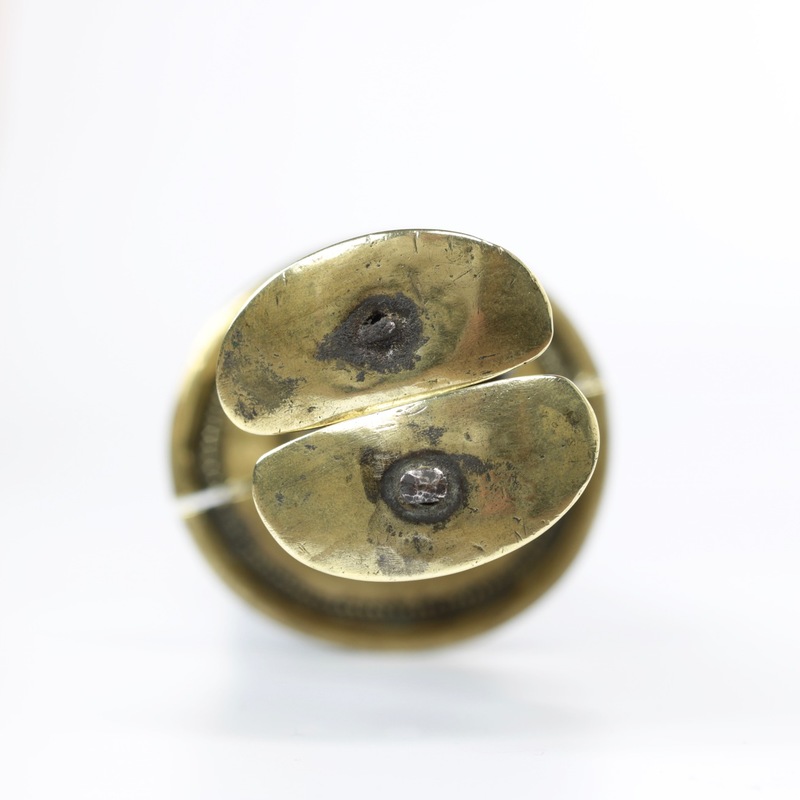 The are fitted in a set of brass fittings of the rounded style, with "horse hoove" pommels that represent a transitional phase between the classic angular style of the 17th and 18th centuries and the round style with flattened ball pommels that was to become the standard for 19th century Qing military sabers. Scabbard mouthpiece is missing. The blades are strictly utilitarian, made for the fight, and no attempt has been made to add to their aesthetic appeal. Both blades have several nicks from other edged weapons and signs of field-sharpening, indicating they have seen active service. There are more nicks on the left hand saber than there are on the right hand saber. This perhaps indicated that the left saber was frequently used for parrying while the right handed saber would deliver a strike in that same instance, much quicker than would be possible with a single saber. The blades have a slight flaring near the tip, a feature that would become more pronounced on the later niuweidao or "oxtail saber". In contrast to the blades, the fittings are of some artistic merit with elegant profile shapes of pommels, the scabbard endpiece and the suspension bar that hark back to aesthetics of saber design of the late 18th century. All fittings are well-made of fairly thick brass, further embellished with elegant sunken lines with dots in relief, following the contours of all fittings, including the inside of the thick rimmed guards. The grip wraps also deserve special attention: They are wrapped in a very rare style where each piece of cord crosses two other cords inside the loop, instead of the more conventional method where it crosses one. 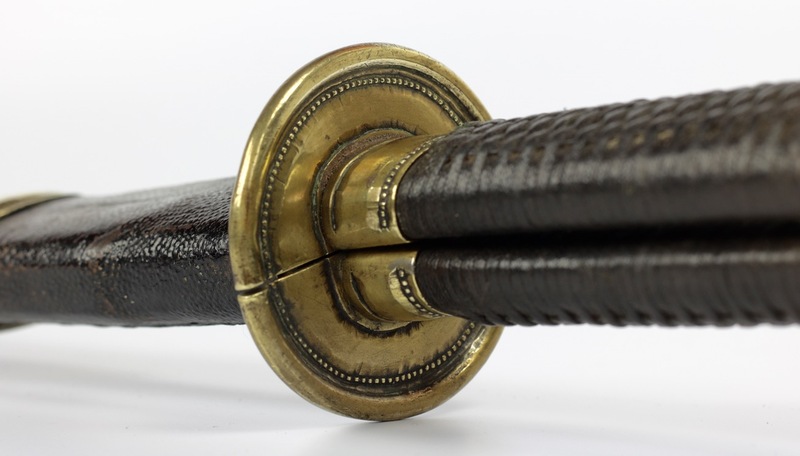 The inside faces of the handles do not have a loop nor crossings, to keep this part as flat as possible so they sit neatly side-by-side in the scabbard. As a traditional grip wrapper myself, I can really appreciate this work and its attention to functionality and aesthetics. It is the most difficult wrap to get right. The hilts are tight, but due to shrinkage of the wood over time there is some movement in the old wraps, yet it is so well done that they didn't come loose. The wraps are black now, but close examination of the fabric shows a deep green which is what very old indigo tends to look like when the blue fades somewhat and yellow staining is introduced. I believe the wraps were originally indigo blue -as per the regulations- and turned ever darker due to handling over the many decades. 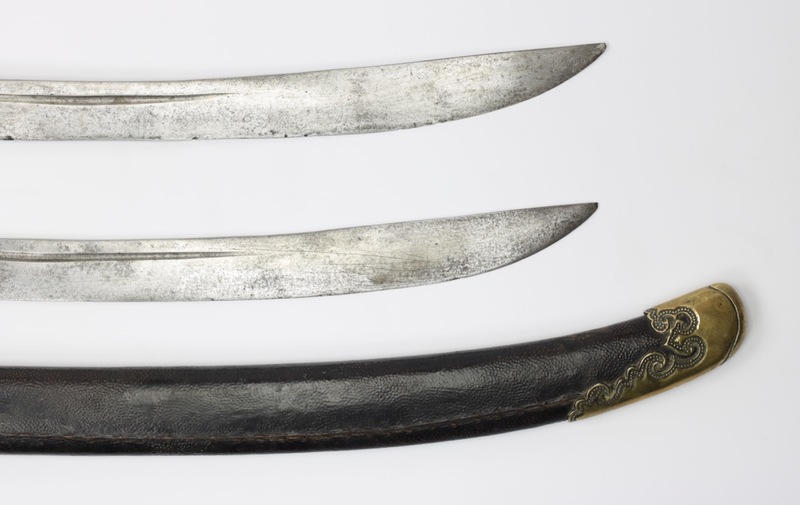 The scabbard is covered with black morrocco-grained leather that is sown together on the right side, indicating that it was meant to be worn on the left side of the body with the hilt backwards, the typical method of wearing the saber under the Qing dynasty military. 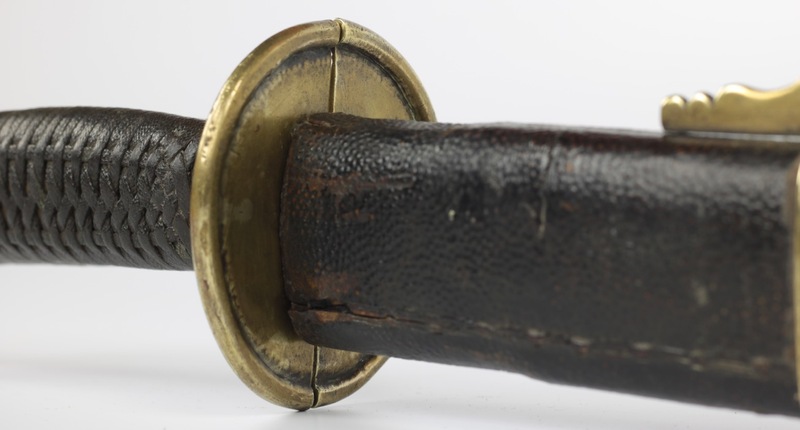 The scabbard has a separate channel for each saber, separated by wood so they do not rub together when worn. Based on the design of the fittings I believe the set dates from the early 19th century. Judging by the overall quality and workmanship I believe it was probably a set made for military use. It was most likely produced for the Green Standard Army, the only part of the military to whom these were issued in quantity. 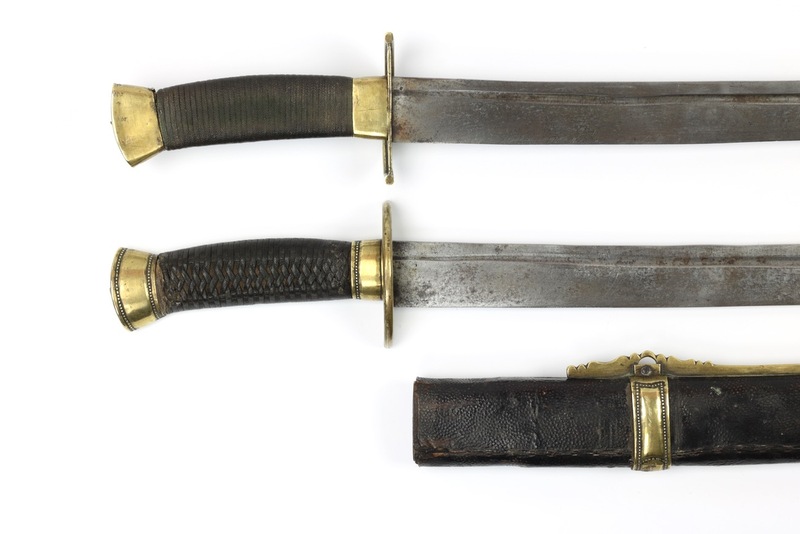 A very rare set of Chinese double fighting sabers of liuyedao form, fitted in mountings that hark back to the aesthetics of the late 18th century. They were once the trusted side-arm of a soldier trained in the difficult art of double wielding sabers, granting him the ability to deflect and strike at the same moment. 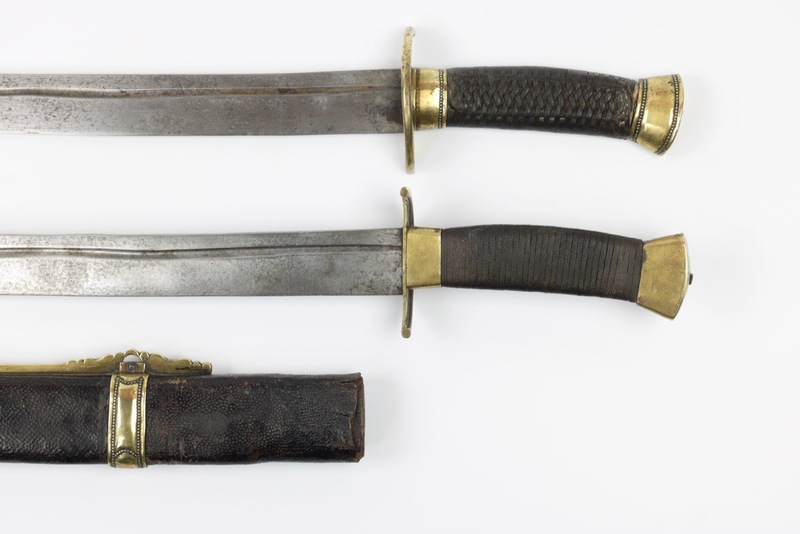 The blades show signs of active service during China's tumultuous 19th century where central Qing authority was challenged by several major rebellions that cost tens of millions of lives. The set can be forgiven its uncharming blades by virtue of its historical value, while the connoisseur will appreciate and the style of mountings and scabbard.